4th Edition D&D, being more tactical in focus, uses tokens, miniatures, and the battle map to great effect. The huge amount of tokens available in the Essentials DM Kit and Monster Vault is great, but I, like many other 4E fans, want to use miniatures in my campaign as often as possible. The problem is, the D&D Minis line can be very, very expensive. Buying a booster and hoping you get what you need is impractical and a poor use of funds. It’s better to know exactly what you are getting, whether that means buying singles from a local shop or online store, or purchasing sets that include specific minis. There are 42 miniatures included in this game, which can be purchased for around $50. This is an excellent deal, especially when you consider the otherwise very expensive large minis, like the Dracolich, included. 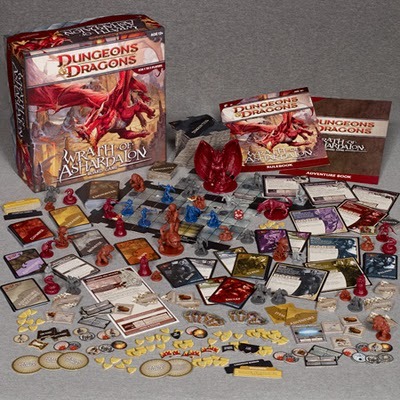 In addition to the minis, various tokens, tiles, and other bits useful in any D&D campaign are included. The only downside is that the minis are not painted, but rather cast in one-color plastic. Most of the monsters come in groups of three. Here are the most useful minis from the Castle Ravenloft box. Spiders – widely useful in a variety of settings: jungles, caves, forests, etc. Wolves – very common in encounters, can also be hellhounds, iron defenders, etc. Additionally, there are several single minis that can represent PCs or important NPCs in the Essential adventures, such as Iron Circle Mages, Dark Adepts, Brutes, Bortek the barbarian, and the gnome illusionists. The zombie dragon can be used as the young white dragon in Cairn of the Winter King. The Castle Ravenloft set is a great value for the miniatures alone. This set, too, is a good value. I think it is probably less useful for the standard campaign than its predecessor, due to the inclusion of strange creatures like grells and gibbering mouthers. However, it’s still a great deal, with many fantastic miniatures for a good price. The single minis in Wrath of Ashardalon are quite excellent. The otyugh and rage drake look great and each are included in the Essentials adventures. The unique orc, duergar, and kobold make good enemy bosses. Add in the tiles and other bits, and you really get lots of bang for your buck with this game. If monocolor minis aren’t your thing, you’re going to pay a bit more for each mini. 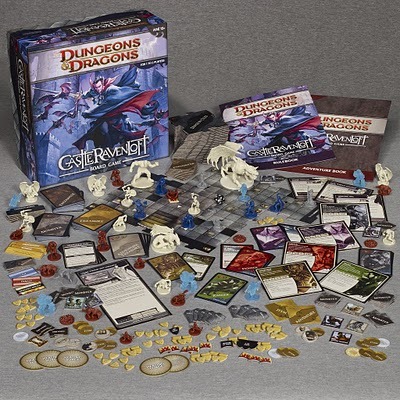 I found the D&D Minis Starter Set at Amazon.com for around $10. It comes with five painted minis, as well as two poster-sized battle maps. One side of one map was repeated in the Red Box, so keep that in mind. However, the jungle temple, flooded ruins, and dwarven outpost maps are very nice and add to the value of the set. The five minis include dwarf and human armored males, as well as a female elf spellcaster. I used the human fighter as Nazin Redthorn in the Reavers of Harkenwold, and the elf as the illusionary form of the gnomes in Cairn of the Winter King. 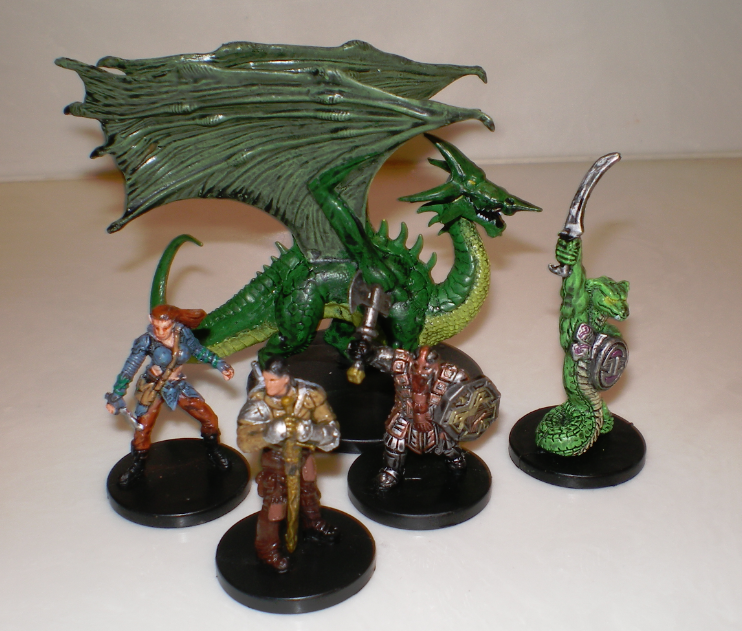 A large green dragon and a yuan-ti are also included. The dragon is very nicely sculpted. These two are not as useful, in my opinion. Still, five minis, including a normally expensive dragon, as well as the excellent maps make the D&D Minis Starter set a good purchase. As I said before, blind-buying booster boxes isn’t a very frugal idea. As long as you stick to common and uncommon rarities, the online prices for singles can be very reasonable. I recommend trollandtoad.com and coolstuffinc.com as well as Ebay. Here’s a list of some of the best values I found as I expanded my collection. Keep in mind I was trying to fill specific needs for the Essentials adventures, and also generic figures I could use often in the future. 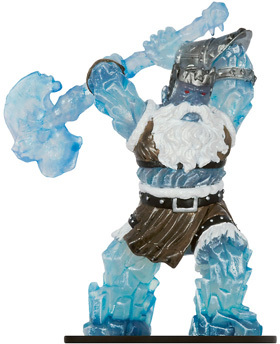 Frost Titan – a gorgeous sculpt, huge in size, with excellent transparency effects. It makes a fine Winter King, and as of this writing is available for a mere $6 at cool stuffinc.com. Doomdreamer – I used these for Ravide the Black, Iron Circle Dark Adepts, and of course they make great cultists of Orcus and that sort of thing as well. There are, of course, many other options out there. The key is to find minis that are generic enough to represent many specific types of creatures, or those that are very common in your campaign. It’s nice to have the perfect mini for every occasion, but you’ll be spending hundreds of dollars in a hurry if you take that route. Splurge and buy a $10 – $20 single every once in a while if you like, but spend most of your budget on generic bad guys, and you’ll have a larger, more useful collection that will serve your campaign needs well for a long time to come. Nice. I love the miniatures. From my experience the best and most cost effective way to start is to buy an unopened case of minis from ebay. Savage Encounters & Lords of Madness cases can be found for around $100 bucks on ebay. Sure you’ll get some dupes, but dupes are necessary too. One case will get you a real good start, then buy individual pieces, like you said, to flesh out your collection. For $1.99 you get a skeletal cyclops who works great as a bone golem and various other large undead. Oh, and the frost titan is currently $4.99 – http://www.trollandtoad.com/p278448.html – I didn’t buy it as I suspect I’d not be using it. Thanks for the comments! I understand that buying a case is a good value as far as cost per mini goes; however, you might end up with bunches of odd commons that you have little use for. I’d rather buy both board games and get minis that I know I’ll be using. Great deal on that skeletal cyclops; I am definitely going to add one of those to my next order. Might do another post like this soon, before the minis get more and more difficult to obtain. Nice article. Just found your blog and have been really enjoying it as I catch up on some of the older posts. If you have time/are looking for topics, I’d love to read a review on the original monster vault and Cairn of the Winter King, similar to the one you did on Threats to Nentir Vale. I’ve found most sites have pretty good deals on the Spirit Folk Fighter which is a fairly generic-looking “guy with a sword” mini that can fill in for a lot of things. Currently under $1 on Gamehollow, but only a few left. The Gold Dwarf Soldier and Dwarf raider are also typically affordable if you’re in need of dwarves. Thanks for reading the blog! I might do a full review of the Monster Vault someday, but I’ve already written about Cairn of the Winter King, though less as a review and more as a reflection. Check it and other Essentials adventures out here. Very nice choices on the minis; I will definitely be on the lookout for those! New To The Blog.. So I’m sorry for replying to a older post.. but thought I’d share what I do..
I’m using “Mage Knight” mini’s… 🙂 I have a friend that gave me 2 copy paper boxes full of this little babies… so I’m using them in the DnD Games.. they look great and work great.. only downsize to them, is they are a tad bit bigger then the DnD Mini’s, but my players don’t seem to mind at all! I know this kinda goes against the whole spirit of the thread, but personally I don’t shell out for minis. I went down to my local craft store and picked up some small 1/2″ diameter spools, elmers glue, and some beads. Glue the beads to the top, maybe use special ones for PC’s and BAM: All the figurines you could possibly need under $10. I also bought a Larger 1″ Spool for bigger Monsters, and a 3″ Cube (dubbed by my players the cube of death) for when I need to depict eldrich monstrosities. I just cast a simple suggestion spell, and suddenly they believe my bits and pieces of wood and plastic are whatever I tell them they are. That can be a whole lot more scary than any actual figurines they see. Imagination is our greatest weapon as DMs. Need miniatures? Get the Adventure series games- Castle Ravenloft, Wrath of Ashardalon, Legend of Drizzt. Each of these boardgames come with 40+ sculpts. Even one of these sets would be enough for any campaign. Add the random dungeon floor tiles, counters,Serious value here. For Humans, Goblins and Hobgoblins I use LotR minitures from GW. You can get them very cheap from ebay (in comparison to the current prices for D&D and Pathfinder miniatures). Numenor makes good Iron Circle soldiers. Also Rohan miniatures should be useful for more usual raiders. I found the idea in another blog where the writer used Mordor Orks as Hobgoblins. At least Hobgoblin/Goblin Shamans can be made by some simple conversion if you have some left over bits from other tabletop games. Great article. What are your thoughts on 3D printers now that they are dropping in price, becoming more common and having people share entire ranges of their 3D models for free online?